Last Thursday I had the great pleasure of being in the question asking chair and having Ian Rankin in the question answering chair at a great event for Shearers Bookshop. Leichhardt Council generously hosted the event at the Town Hall, for free, with added wine and nibbles and around three hundred people duly turned up. It was a lot of fun doing the research to prepare for the event. Took me back to my MA exegesis and the conference papers I wrote one of which, Crime Fiction and The Politics of Place: The Post 9/11 Sense of Place in Sara Partesky and Ian Rankin ended up as a chapter in The Millennial Detective. 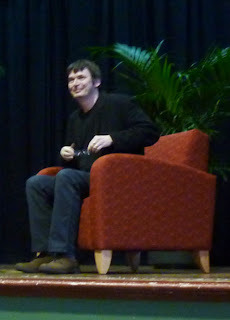 I finally found some clips of Ian Rankin's Evil Thoughts, as it's not made it to OZ. I highly recommend the scene of Mr Rankin being exorcised by a sad-eyed old priest at the Vatican. It was a marvelous atmosphere, and Ian Rankin was an engaging and generous interviewee, particularly as I had attended his event the previous day at Stanton Library where I was directed to fill up a front seat and proceeded to slightly freak the poor man out by taking copious notes. No, not at all stalkery. The good people at Shearers have blogged a round up of the night - so if you missed it, you can catch up on all the news about Rebus. He's baaaaaaaaaaaack!!!!!! And in today's Sydney Morning Herald, my review of Standing in Another Man's Grave. 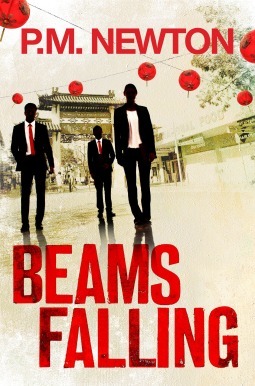 "Whatever the future holds, Rebus is back and there's likely to be a bit more rage before the dying of his light." Whatever the future holds, Rebus is back and there's likely to be a bit more rage before the dying of his light.